very flavorful with just enough seasoning. It was still tasty and delicious, the black-eyed peas were our favorite. Great soul food. Everyone very nice and the customer service is excellent. I would recommend trying them if you come or are here in Houston. so my mama's been dying to eat lunch wit me but our schedules conflict and she lives in Spring. I live in third ward. traffic is trash. so today we made it happen at a place we both never had before. apparently they got a show on Oprah's network and she wanted to try them. 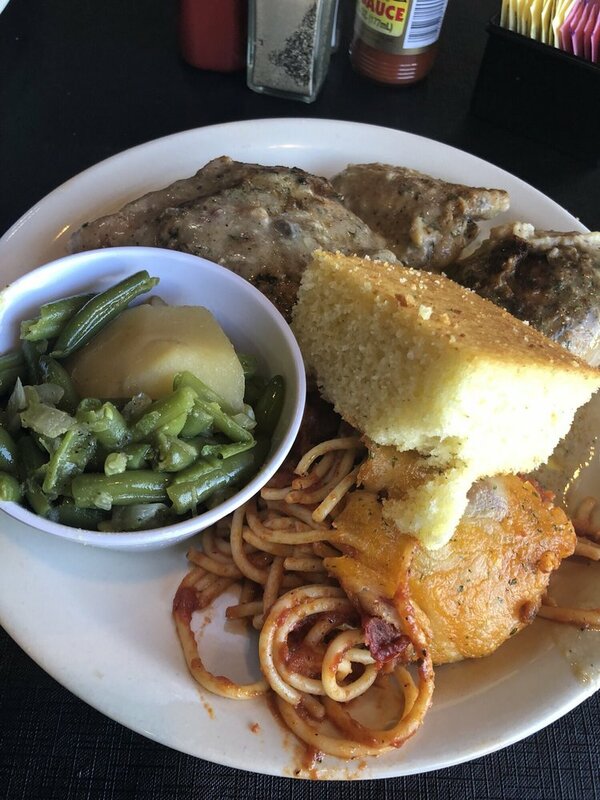 im very judgmental towards soul food restaurants so here's my break down of all the food we tried. baked chicken: looked smothered. tastes good. the chicken skin has a lot of flavor in it. the conebread: not really sweet but not hot water cornbread either. even taste. no nasty after bite taste. green beans: solid. the potatoes just all in the way. spaghetti: tasty with a pinch of sweetness. mac & cheese: im good on it. oxtails: they are not as tender as I would like them to be. im a slow cooked fall off the bone type oxtail eater. these not that. still edible though. yams: now look. im weird. i never like yams. ever. not my granny's. not my mama's. but i would eat these. the texture of them reminds me of biting into a sweet potato pie (which i know is yams. i only eat that. which is why i said im weird about it). its not overly sweet. its ideal for me. lemonade: sugar, water and the color yellow. theres no true ambiance's here yet cuz you can tell they bought out an old hispanic restaurant and flipped it. id come back here again but only when Im ready to take a nap. cuz the itis is upon us.